Are Pesticides Killing Our Pollinators? Did you know that honey bees in the United States pollinate about $10 billion worth of crops each year, including apples, berries, cantaloupes, cucumbers, and almonds? (Texas A&M Univ, 2009) In Texas alone, the value of crops pollinated by honey bees is estimated at $480 million each year. Considering this powerful contribution to food production, the decline of their populations and ongoing death toll may mean big losses. Rowan Jacobsen, author of Fruitless Fall: The Collapse of the Honey Bee and the Coming Agricultural Crisis, talks about how honey bee populations from across the US and Europe began drying up unexpectedly in 2006. (KEXP Interview, 2008) Termed by researchers as Colony Collapse Disorder, the specific cause of death for widespread bee populations still seems to be stumping the lot. 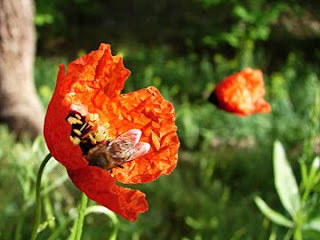 The fact that more than 100 of our main food crops necessitate the cross pollination thoughtfully performed by these little creatures—pollen flown from one flower to the next—concerns agriculturalists both large and small. The agricultural monocrops of today demand armies of bees, traveling in truckloads across the countryside from farm to farm just to get the job done. Highly stressed bees fed from jars of high fructose corn syrup does not seem to be the most ideal living and working environment for these special insects. While many factors have been analyzed as the potential cause of their recent decline, the most personally compelling is that of the insecticides and pesticides we dump into our crops every year. Neonicotinoids are not your traditional spray on/wash off bug repellent. This breed of toxin is actually systemic, in that the seeds are coated before planting and then are manifested throughout the life of the fruit-bearing plant, showing up in the nectar and pollen transported by honey bees and other wild insects. Is there a more responsible and healthful approach when it comes to food production and consumption besides giving in to our cheap industrialized food system? Making the choice to select food that is grown as locally as possible, as fresh as possible, and organic if possible is easier and less costly than the alternative if we understand why it is important to our ecosystems, our health, and our future. For the full interview with Rowan Jacobsen, listen to Sustainability Segments: Rowan Jacobsen (mp3 audio).